I just downloaded synergy 1.9 rc3 from the General Discussion Thread for Windows and Ubuntu. I use Windows as the server and configured it like version 1.8.8 before. But it seems that after starting the server it does not open port 24800 for listening. I uninstalled and reinstalled synergy several times and also restarted Windows in between. I also deactivated my Virus scanner for testing purposes. I tried with and without ssl encryption. Nothing works. I am using Windows 7. 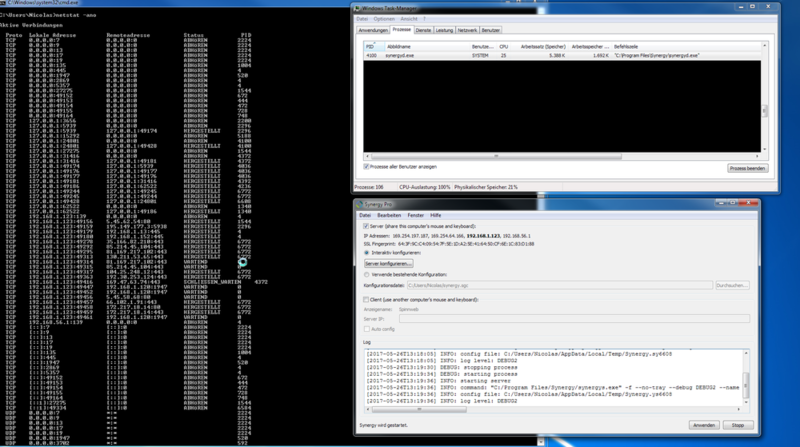 Here is a screenshot of the task manager, netstat and synergy itself. Please post a screenshot of your client machine's Synergy interface while it tries to connect to your server machine please. This will not help you. It just times out. And from the netstat command you can see that the server does not even listen on its port (24800). So every connection from an other machine to the server will time out. Are you serious? If you are a developer you know that it will not help you knowing what the client machine's interface says. It just can not connect because there is no open port to connect to. Start a client without a server and you see the same error as I see. Please stop quoting yourself again. I am a developer myself and you can believe me with what I am saying. Even netcat is not able to connect to the server. I won't be asking for it if I don't need it @ntq. Also, I have noticed that the Synergy interface on the server does not have the confirmation that the server is started. It only has "starting server." I also noticed it. How can I debug that issue. At the moment I am running 1.8.8. as server on Windows 7 and 1.90 rc3 as client on Ubuntu. It seems that even DEBUG2 does not show sufficient information about the issue. I still do not know what this will help you. The server does not listen so it is irrelevant what the client says. It's just a timeout. Are you a developer? Here is your log. It's exactly the same as when you don't start a server but then try to connect with a client. What's the version of OpenSSL on your Ubuntu machine @ntq? It's 1.0.2g-1ubuntu4.6. And libssl has version 1.0.2g. It works well together with the version 1.8.8. But that all does not help when the server doesn't listen on a port. Are you a developer? I am not a developer @ntq. But I'm working with our developers. We've tracked it down to a spinning loop in the service but we're still trying to figure out what could be causing it. We've also verified that it only happens in v1.9 and only in release mode. We hope so @ntq, and we hope it'll be sooner. We will be posting it here, or update the featured thread once we implement a fix for it. But it seems that nobody of your developers care. I don't understand why I even paid for this if such simple bugs don't get fixed. I bought it and I want to able to use my licence. Hi @ntq. @Andrew Nelless already replied on that open issue that the bug has already been fixed with v1.9. Somehow I am no longer able to find the thread announcing v1.9 and the search function of the board does not help me either when searching for "1.9". Is there a new version available already?